It was difficult at the beggining but i love the effect. I discover my new passion, color katanas hahaha, seriously i enjoy a lot do that sparkling things and shines xDD. And of course, it was neccessary put a sunset, why i love sunsets so much? maybe i have a problem with that T.T hahaha. Stop writting in bad english! i hope you enjoy watching the pic like i enjoyed coloring it!! See you dears! thank youu! all the merit is from cromarlimo because he did the lineart, i just colored it hahaha. Thanks!! I read from somewhere that each of the Straw Hats has an animal spirit. Zoro has a shark. This coloring is breathtakingly beautiful. 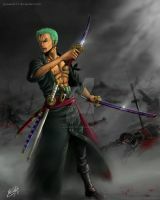 I love the background because it goes great to highlight Zoro.. it! thanks dear, you're super kind!! I'm sketching your Mirajane-Laxus commission muahahaha i'm enjoying that xDD. you're most welcome! I'm having a major One Piece Phase at present! 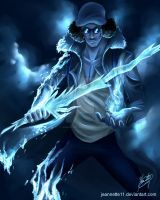 I think Trafalgar Law might be becoming on of my fave one piece characters aha. And oooooo you are? Can't wait to see it! glad your having fun! oh he's just so ... ughhhhh ... I just don't have the words to describe him! Love this so so so so so much! Oh my goodness!!! That is so beautiful!!! The way you colour is so wonderful and inspirational! I think you and Limo work so well together!! Mueeeroooo! Qué sersy que es, ains! jajaja es que zoro es demasiado para nuestro body xDD.